Wait, you’ve never had that question? We at Capital Fence get it pretty frequently, and we don’t mind telling you our recommendation is: to get a survey. While you may be able to find the pins on your property and think you’ve got a good grasp on your property boundary, and sometimes that does work out…but sometimes it doesn’t, and this can lead to big problems. Problems that may not arise for a few years, but the problems can be big. A boundary survey determines where the property lines are, along with the corners of the land. Indications of any easements or encroachments and possible limitations imposed by state or local regulations can be found on a professional survey. Typically a survey is done before the purchase of any property. You may be able to find the survey with your closing paperwork from when you purchased your home. Having a survey done can save you from unknowingly violating certain zoning restrictions that may be enforced where you live. This can become a major legal hassle, and who has time for that stress? As the homeowner it is your responsibility to give the fence company the full outline of your property. A plat alone will not do that. Wood stakes on your property don’t always give a full depiction of property lines. 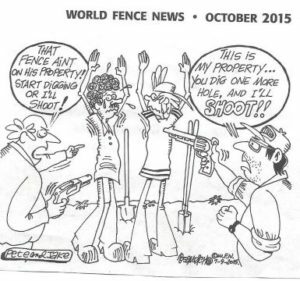 And in the end, the customer is responsible for fence placement and property lines. Save yourself some legal woes, headaches, and the chance of creating a bad relationship with your neighbors, and get a survey done before making changes to your property, that includes adding a fence.